Rare unusual and slow growing, Echeveria unguiculata is a small rosette forming species not widely offered for sale. The foliage is violet to gray colour, the individual leaves are curled and naturally narrow. The tips of the foliage are tipped with a small very dark maroon spine. Foliage colour will vary with the amount of light as well as other typical succulent stems factors. Echeveria unguiculata will flower with pink to orange flowers rising well above the foliage. 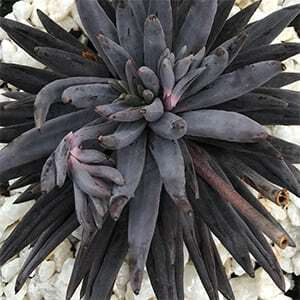 Like all Echeverias this is a drought tolerant plant, and is fairly easy to grow. The best time to propagate Echeveria is from spring through to winter, the easiest method for this species is by leaf propagation. Leave the parent leaf to drop of of its own accord. It is also possible to remove offsets as they appear. Foliage – Gray to violet. Flower – Pink to Orange.